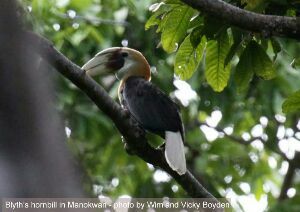 Manokwari is a nice destination for visitors who are interested in hiking and watching birds in the rainforest. There are regular flights between Manokwari and Jakarta (the capital of Indonesia served by such airlines as Sriwijaya, Lion/Wings, Batik Air and Garuda. Birders usually go to Arfak mountains to watch paradise birds or do night walk to see fireflies, glowing mushrooms and cuscus possum. There is a forest in the eastern region of Arfak mountains where visitors can enjoy hiking to watch several species of tropical birds such as Lesser Birds of Paradise (Paradisaea minor), King Bird of Paradise (Cicinnurus regius), Magnificent Riflebird (Ptiloris magnificus), Common Paradise Kingfisher (Tanysiptera galatea), Great Cuckoo Dove, Beautiful Fruit Dove, Rufous-bellied Kookaburra, Brown Oriole, and Coconut Lorikeet and a lot of other birds that are endemic to Arfak range. Lesser Birds of Paradise usually dance in the mornings and in the afternoons in the rainforest near basecamp that we have built for tourists. Birders need to walk up steep slopes to reach it. So, only birders who are physically fit that can go to the place. They must wear good sport shoes or trekking boots and bring binoculars. We have prepared mattrasses, pillows, cooking and eating utensils for tourists who want to spend several days exploring the bio-diversity of animals and plants in this forest. Besides watching birds of paradise, other interesting attraction is watching cuscus and exploring the jungle itself at night. The tropical rainforest is home to various species of plants, and animals, including mushrooms that glow at nights, orchids, bamboos and a lot of insects. In addition to Mesirrokow as one of the best birding sites in the bird's head region of West Papua, the most recommended site for hiking and birdwatching in Vogelkop region is Mesirrokow forest. Located in lowland region, Mesirrokow is only one hour car trip from Manokwari. In addition to hiking and birdwatching, another activity that tourists can enjoy in Mesirrokow is swimming in the river. Another important birdwatching destination in West Papua is Miyah forest. Located in Tambrauw mountains, it is considered one of the most important birding sites in the world. 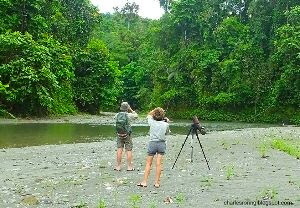 This may sound subjective but Miyah forest is a must see place for birdwatchers who really want to see a lot of birds that are endemic to New Guinea. As a tourist guide, I offer birding tours for nature lovers who want to watch birds in Miyah. From my previous trips, I saw Lesser Birds of Paradise, Pinon Imperial Pigeon, Blyth's Hornbill, Palm Cockatoo, and many other birds that I cannot mention their names one by one in this post. Visitors can go by 4WD pick up truck and continue their trip on foot to the forest. It will take a half day to reach Miyah. Tents and camping gear are needed if they want to stay in the jungle for a few nights. Since electricity is not always available in the forest, visitors need to bring some extra batteries for their cameras. The mountain range of Arfak is located in the south of Manokwari city. 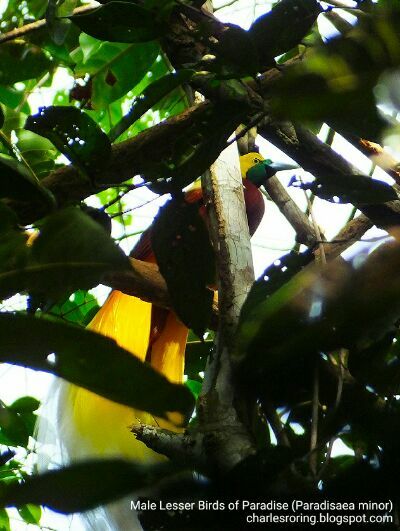 It is a popular destination for watching various species of paradise birds and other tropical birds that are endemic to rainforest of New Guinea. There is a birding and wildlife watching site that I highly recommend for birdwatchers. Its name is Susnguakti forest (located in the eastern side of the mountains). As a tourist guide, I have organized numerous tours to this forest for visitors who come from European countries such as Sweden, Poland, the Netherlands, United Kingdom, Belgium, Germany, Spain, and Switzerland. There are also tourists who come from the United States, South Korea, China, and Australia. Some Indonesian tourists visited this forest too. Most of them went to Susnguakti forest to watch paradise birds during the day and cuscus possum at night. The location of Susnguakti forest is approximately at around 400 to 700 meters above sea level. Visitors who go there need to walk up steep slopes of Arfak range to reach it. Susnguakti forest is a great place for watching lower montane forest birds such as Lesser Birds of Paradise, King Bird of Paradise, Hooded Butcherbird, Common Paradise Kingfisher, Beautiful Fruit Dove, Rufous-bellied Kookaburra and Coconut Lorikeet and a lot more. The birds of paradise can be watched early in the mornings and late afternoons. The birding sites are within the walking distance from our basecamp approximately 10 to 15 minutes. 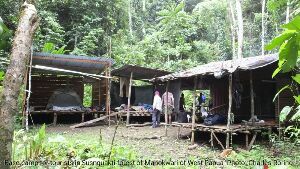 I and local villagers have built huts for tourists who want to stay for several days in the jungle watching birds, and other animals. Because birds of paradise like to dance or perch on high trees, visitors need to use a good pair of binoculars to watch them. 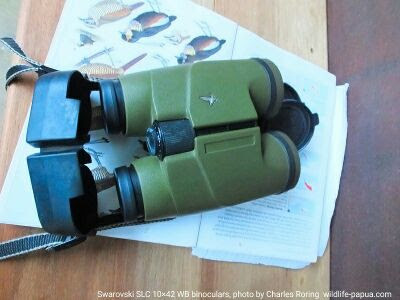 There are a lot of birding binoculars that are available on the market. The ones that produce sharp images are Swarovski EL 8.5×42 and the multi purpose Swarovski SLC 10×42 WB. There is also Canon 15×50 IS UD binoculars that are powered by image stabilizer technology. Binoculars that are made of high quality materials such as Extra-low Dispersion Lenses and Bak4 prisms glasses will produce sharp and rich color images of birds, butterflies, wild flowers and anything in the jungle. 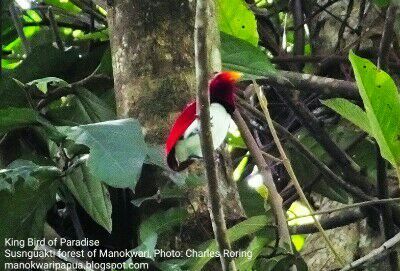 If you are interested in traveling to Arfak mountains of Manokwari to watch paradise birds in the jungle, please, contact me (Charles Roring) - by email: peace4wp@gmail.com or send whatsapp text message to my number +6281332245180.